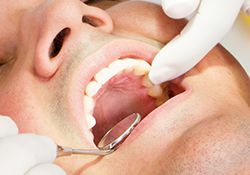 Badly decayed, broken, and missing teeth can all negatively affect the appearance and functionality of your valuable smile over time – and these problems tend to only grow worse the longer they’re left untreated. That’s why pursuing restorative care as soon as possible at a trusted dental practice is so important. At Dentistry by Design, Dr. Luke Lumpkin is likely to recommend a custom, high-quality dental crown or bridge as the ideal replacement for suffering dental structure. Metal-free materials are available for a beautifully seamless appearance as well! Please contact our Bartlesville, OK location to learn more, or if you’re ready to schedule your first appointment. Dental crowns are designed to cover the entire visible structure of a single tooth, providing much-needed strength, protection, and support. This restorative solution is often recommended to correct a variety of dental concerns, including severe tooth decay that can’t be treated with a tooth-colored filling, structural damage, excessive sensitivity, or cosmetic imperfections. 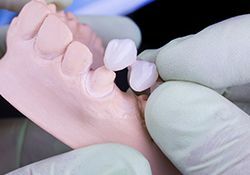 Dental bridges can rebuild consecutive missing teeth along a single row in a sturdy and functional fashion. 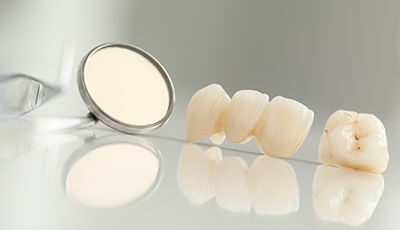 Many patients prefer this tooth replacement solution to traditional dentures because additional dental crowns are designed to fit over nearby healthy teeth and effectively “anchor” the new bridge in place, making it a permanent solution.